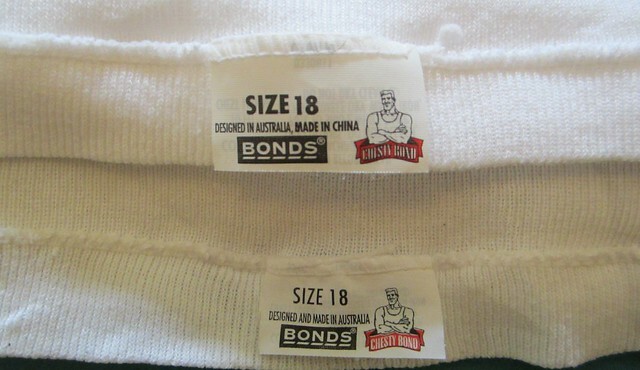 The Chesty Bond singlet, something of an iconic Australian brand, used to be made in Australia, but is now made in China. I find that a little sad, but I suppose it’s a sign of the times. I seem to recall hearing on the news the other week that manufacturing as a percentage of Australia’s Gross Domestic Product had fallen from 12% to 8% in recent years, and figures on TradingEconomics.com appear to back that up. The estimated total net subsidy equivalent for the automotive industry of $1.13 billion is equivalent to $23 500 per worker, based on employment levels of 48 000 (based on employment data classified by ANZSIC codes drawn from ABS 2007a). Wow. And that was in 2008… recent grants would imply it’s jumped since then. I would hope that everyone is actually considering what issues matter to them, and deciding how to vote on that basis, rather than just blindly voting for one side or the other. Of course, it’s not just a matter of chosing Labor or Coalition, particularly in the upper house. It may well be that The Greens get close to having the balance of power in the Senate. Here are some quick and not-necessarily very well thought out notes on a few Federal election issues. Seems to me that the Australian economy didn’t suffer as much in the GFC due to the management of past governments of both sides, going back a decade or more. The relatively well-regulated banking sector (compared to places like the US), put in by Hawke/Keating and maintained by Howard ensured the financial institutions didn’t collapse as they did in some countries. Howard handed over a healthy surplus to Rudd. Yes, the government’s in debt now, due to stimulus spending which appeared to work in terms of keeping unemployment levels down. The schools stimulus? People are complaining, and there were definitely problems with the implementation, but my kids’ current and past schools both benefited from new buildings, so it’s not like it didn’t have its plusses… and only 2.7% of schools complained. Ditto the home insulation scheme (see below). To draw a possibly shaky analogy, the stimulus spending is a bit like Y2K — people complained that the effort expended wasn’t worth it because they didn’t see big problems eventuate. When Y2K happened, I saw small problems, and it was pretty obvious to me that if the work hadn’t been done, there would have been HUGE problems. If you hadn’t spent the money, there would have been waste. The waste would have been the fact that the economy would have been weak, there would have been a gap between what the economy could have produced and what it actually produced – that’s waste. You would have had high unemployment, you would have had capital assets not fully utilised – that’s waste. So your choice was one form of waste verses another form of waste. And so it’s a judgment of what is the way to minimise the waste. No perfection here. And what your government did was exactly right. So, Australia had the shortest and shallowest of the downturns of the advanced industrial countries. Both sides claim they’ll get the budget back into surplus within a few years, so I don’t see a major problem here. Again, it’s not like we’re in the deep hole the US or Greece or plenty of others are in. I don’t at all have a problem with borrowing to make worthwhile investments. Heck, most of us do it. As for claims the coalition are better economic managers, it seems Joe Hockey keeps making mistakes in his statements on the matter. This is my major problem with both major parties: they don’t have a coherent plan to cut emissions; just vague and/or not-very-impressive goals. Labor’s insultation insulation scheme was a great idea — it hit the buttons of stimulus spending to help employment, and real action to reduce energy use and emissions. (Someone should publish a study on how much energy it’s saving this winter.) But it was terribly badly implemented, with cowboy operators taking advantage, resulting in unsafe work, numerous fires and the tragic deaths of installers. The Coalition say they’ll meet their emissions reduction target. But their target of 5% reduction (from 1990 levels) by 2020 is pathetic. Demographer Peter McDonald warns that we are blaming migrants for our failure to plan cities properly. I couldn’t agree more. If we choose to do it and manage it well, Melbourne could become bigger in population, without PT becoming unusable, and without sacrificing livability. Other cities have managed it. Whether that’s what we want is the question; not where the people come from. Given such a tiny proportion of immigration is refugees arriving by boat, neither party is really addressing the real issues here. And any promise to cut migration is pretty empty, given it’s already dropping rapidly. 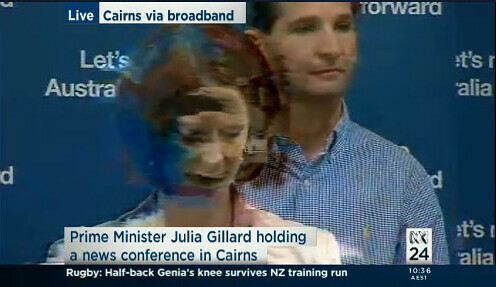 The distorted, out of sync video of Julia Gillard’s press conference via a broadband connection from Cairns shown on ABC News 24 on the 4th of August was evidence that some parts of the country are missing out on the biggest benefits of high-speed broadband. Maybe it’s not a problem if the Real Julia is out-of-sync and suffering from MPEG compression artefacts, or if the kids in the outback can’t watch HD Youtube of someone’s cat. It might be a problem if it were a connection set up between a patient and a medical specialist though. And it may well hold back development of high-tech industry (and more importantly, high-tech assisting other industries) in some parts of the country. But while I’m convinced of the benefits of a high-quality high-speed broadband network, I’m in two minds about whether $43 billion of public money should be paying for it, since in the next decade, wouldn’t the major telecommunications companies be able and willing to provide the type of service proposed, at least in urban areas where it’s likely to be profitable? Perhaps the point is to leapfrog anything what could be provided by the private sector, and trigger high-tech economic growth, as well as essentially replace the current (degrading) copper network. Evidently the implementation study shows it would be worthwhile. I suppose (at first glance) the Coalition are proposing something a lot less impressive, aimed at getting more of the country up to the current standards (ADSL2+ and similar), rather than a bold new super-fast Fibre-To-The-Premises-type future. Certainly it seems to be getting flak for proposing too much reliance on wireless, as well as older technology including copper wire, and not providing fast enough speeds. I think the whole idea of the filter is flawed, like some kind of luddites destroying looms. And the proposed implementation — with a secret list — wasn’t going to work. The emphasis should be on providing opt-in tools and education (such as: parents not placing computers in kids’ bedrooms, but in public parts of the house), and taking down the publishers of dodgy material. As such, the Coalition announcing they wouldn’t implement it is a positive move, and credit to them for it. Of course, it should go via Canberra — in fact Sydney to Canberra should probably be the first stage, to relieve Sydney airport. (In fact maybe if trains between the two ran every 15 minutes and the trip was about an hour, Canberra should become Sydney’s second airport?). But Canberra to Melbourne presents big problems (a lot of extra cost) with mountains getting in the way, unless you take a big detour. Interesting that after a push from the Greens, Labor has announced they’ll do a feasibility study if elected. But they appear to be talking about Sydney to Canberra in 2.5 hours, not one. And Sydney to Melbourne in 6 hours, not 4. Hmmmmm. Labor announced they would fund Brisbane’s Petrie to Redcliffe railway; the Coalition matched it. Things have obviously changed since the days when the Coalition refused to fund urban public transport, which is good to see. The Rudd government funded most of Victoria’s Regional Rail Link. Whether either side will pledge more projects remains to be seen. Doing so in a targetted manner might well provide them with the kind of direct action against climate change that they seem to want to fund. Update 7:55am. Labor have just announced they will fund Sydney’s Parramatta to Epping rail link. Check this great piece by Annabel Crabb on how the campaigning works. That’s all I have so far. Thoughts?